The lectures you are about to hear were delivered by L. Ron Hubbard from December 1963 through August 1966 to the students of the Saint Hill Special Briefing Course in Sussex, England. 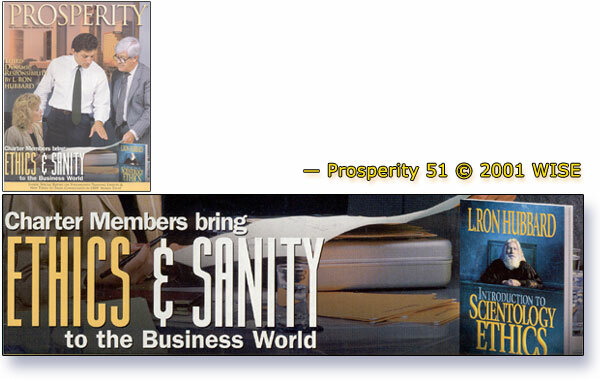 These years represent one of the most exhilarating periods in the history of Scientology. A great deal of the fame of the Saint Hill Special Briefing Course came from the fact that while Ron was lecturing to the top auditors of the day from around the world, training them and improving their skills, he was concurrently mapping the route to full OT. This gave his lectures to these students an even more special flavor: the thrill and exhilaration of discoveries just made, of barriers to sanity defeated. From the research and testing of this period came much of the technology standardly in use around the world today, including fantastic advances in E-Meters and their use, prepared lists and remedies, the full technology of study and codification and standardization of the Bridge to Total Freedom. In the accompanying lectures Ron thoroughly covers the subject of Suppressive Persons and their victims—the PTS. Here is the technology to confront and shatter suppression and put one at cause. This is technology for every being. It not only assures one’s progress up the Bridge, and the gains that are available each step of the way, but is technology that puts one at cause in every aspect of life. 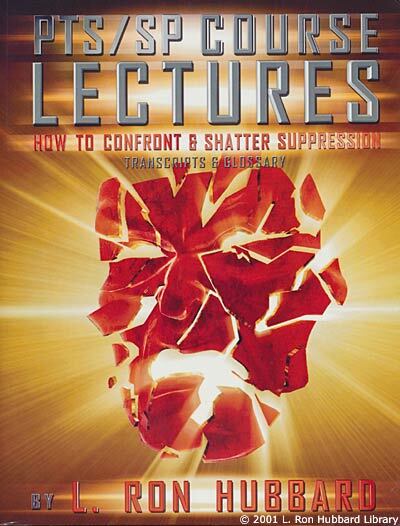 While these lectures were originally recorded many years ago on equipment which is long since obsolete, the most meticulous care and procedures were used at all stages of production to reproduce these priceless lectures with the highest possible quality, using Ron’s Clearsound state-of-the-art sound technology. 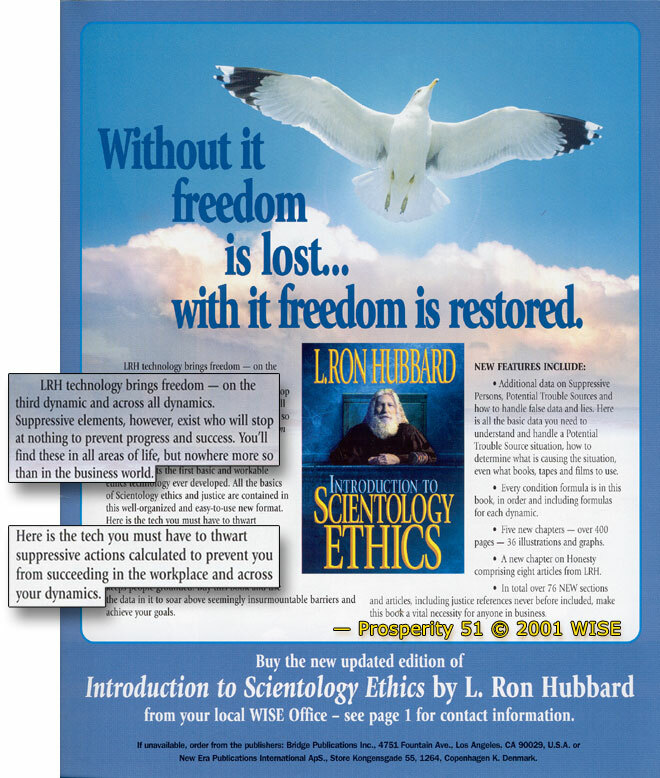 To help Ron safeguard Scientology Orgs, Scientologists, and Scientology by effectively carrying out all intelligence activities which lead to the future prediction of areas of trouble and which lead to the resolution of such areas before trouble occurs; to ruthlessly prosecute all traitors damaging Scientology Orgs, Scientologists and Scientology to the end product of successful legal actions; to detect and handle the Suppressive exterior to Scientology Orgs and Scientologists who uses his power and position or the power and position of authorities to attempt to stop the forward progress of Scientologists and Scientology. 1. To direct the functions of the three branches of the Intelligence Bureau. 2. To ensure effective investigation is done on persons or groups assessed as future or present sources of trouble. 3. To ensure data obtained from investigations conducted is used to deter utterly the traitor or the Suppressive from continuing his destructive actions. 4. To ensure that the Intelligence CIC Board (Combat Information Center) is maintained in present time. 5. To ensure all Intelligence cross-filing is done correctly so that proper appreciation (evaluation which leads to the spotting of Trouble Sources) can be done. 6. To ensure that all actions not pertinent to the Intelligence Bureau are kept off Intelligence lines and routed to to the proper terminals in the Org for handling. 8. To ensure that clipping files are kept under headings of interest to Scientology so that studies of same can predict future actions and so that Intelligence investigations can be done to meet such situations or trouble or the data can be used to the benefit of Scientology. Example: medical, psychology, psychiatry, etc. 9. To keep the Guardian and the Founder advised of such future situations so that action can be directed along all possible fronts. 10. To see that monthly reports with regard to SO No. 1 letters is sent to the Guardian. 11. To use quantity of Ethics actions or deadfiles of an area or Org to assist the Guardian and the Founder in taking action necessary to handle possible incompetence or trouble in such areas. 12. To ensure that Intelligence Officers are appointed in all Orgs. 13. To see that all such Intelligence Officers report any emergency or attack on Scientology immediately to the Guardian’s Office WW, giving who attacked, nature of attack, when attack occurred or will occur, where attack took place and source of data concerning the attack. 14. To ensure all Intelligence Officers give summaries on all investigations being conducted and to see that such summaries report facts and facts only. No generalities, evaluations, suppositions or conclusions are wanted. Only specifics and facts are wanted. 15. To ensure that investigators submit proper reports and to ensure that proper investigation procedure is followed covering the time track of the individual concerned to discover any outness of facts or missing areas of time so as to locate hidden, undisclosed criminal actions. 16. To communicate useful data to other Guardian Bureaus, particularly legal and public relations. 17. To ensure that all Intelligence activities are productive and all intelligence personnel are effective. 18. To be ever vigilant to the constant possibility from governmental areas, in particular attacks from medical, psychological and … within governments; from tax agencies within … Immigration agencies. 19. To keep Ethics in on yourself and on your personnel so that Admin and Tech stay in. 20. To evaluate what investigatory actions are most important now and in the future. 21. To make things go right on your post. 22. To WIN in all Intelligence activities. Alteration of orders and tech is worse than noncompliance. Alter-is is a covert avoidance of an order. Although it is apparently often brought about by noncomprehension, the noncomprehension itself, and failure to mention it, is an avoidance of orders. Very degraded beings alter-is. Degraded ones refuse to comply without mentioning it. Beings in fair condition try to comply but remark their troubles, to get help when needed. Competent higher-toned beings understand orders and comply if possible but mainly do their jobs without needing lots of special orders. Degraded beings find any instruction painful, as they have been painfully indoctrinated with violent measures in the past. They therefore alter-is any order or don’t comply. Thus, in auditing pcs or in org, where you find alter-is (covert noncompliance) and noncompliance, given sensible and correct tech or instructions, you are dealing with a degraded low-level being and should act accordingly. One uses very simple low-level processes on a degraded being, gently. In admin, orgs and especially the Tech Div where a staff member alter-ises or fails to comply, you are also dealing with a degraded being but one who is too much a pc to be a staff member. He cannot be at cause, and staff members must be at cause. So he or she should not be on staff. This is a primary senior datum regulating all handling of pcs and staff members. A degraded being is not a suppressive as he can have case gain. But he is so PTS that he works for suppressives only. He is sort of a super-continual PTS beyond the reach, really, of a simple S&D and handled only at Section III OT Course. Degraded beings, taking a cue from SP associates, instinctively resent, hate and seek to obstruct any person in charge of anything or any Big Being. Anyone issuing sensible orders is the first one resented by a degraded being. A degraded being lies to his seniors, avoids orders covertly by alter-is, fails to comply, supplies only complex ideas that can’t ever work (obstructive) and is a general area of enturbulence, often mild seeming or even “cooperative,” often even flattering, sometimes merely dull, but consistently alter-ising or noncomplying. This datum appeared during higher-level research and is highly revelatory of earlier unexplained phenomena-the pc who changes commands or doesn’t do them, the worker who can’t get it straight or who is always on a tea break. In an area where suppression has been very heavy for long periods, people become degraded beings. However, they must have been so before already due to track incidents. Some thetans are bigger than others. None are truly equal. But the degraded being is not necessarily a natively bad thetan. He is simply so PTS and has been for so long that it requires our highest-level tech to finally undo it after he has scaled up all our grades. Degraded beings are about eighteen to one over Big Beings in the human race (minimum ratio). So those who keep things going are few. And those who will make it without the steam of the few in our orgs behind them are zero. At the same time, we can’t have a world full of them and still make it. So we have no choice. And we can handle them even when they cannot serve at higher levels. This is really OT data, but we need it at lower levels to get the job done.